What is the European Le Mans Series? Know All About It! This year Howards Motor Group are proud to be one of the main sponsors of So24! By Lombard Racing with one of our very own Directors, Jonathan Coleman racing in the team. Because of this, we’ve decided to dedicate this blog to European Le Mans Series which includes everything you need to know. To find out more about our sponsorship with So24! click here! What is the European Le Mans Series? In a nutshell, the European Le Mans Series is a European series of endurance races reserved for cars such as "Le Mans Prototypes" and "Le Mans Grand Touring". In 1998 Don Panoz, an American Entrepreneur brought the rules and racing formulas of the famous 24 hours of Le Mans to North America, this was called Petit Le Mans. The series then changed name to the American Le Mans Series (ALMS) in 1999. At the time Europe was lacking Le Mans Prototype racing. Following the success of the American Le Mans Series, led by Don Parnoz, he attempted to bring prototype racing back to Europe during the 2000 ALMS season. Races were secured at the Nurburgring in Germany and our home Silverstone circuit. After the success of these two races, European Le Mans Series was launched in 2001 which included five races covering 1000 miles in total and automatic entry into the 24 Hours of Le Mans for each class winner. As the sport was being developed in 2001 some races were shared between ALMS and ELMS. 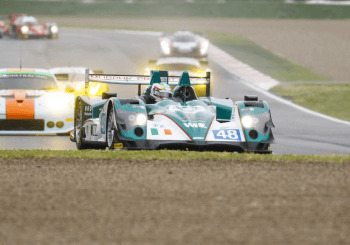 Due to logistical issues involving ALMS teams having to cross the Atlantic to compete in ELMS shared races the number of entries fell from 25 at the beginning of the season to a mere 14 at the end. Therefore the European Le Mans Series folded after the 2001 season which lacked involvement from teams and was unable to attract attention of the media. Automobile Club de l'Ouest (ACO), a large automotive group in France saw the success of the American Le Mans Series and decided that they should run a series by themselves for Europe. ACO wanted longer endurance races than ALMS ran and would only be Europe based not international to attract sports car teams to the series. ACO announced their plans in 2003 for Le Mans Endurance Series with similar rules and prototypes to the original European Le Mans Series. The year of 2004 saw the first five-race season of the new series with a large number of competitors which led to its success. In 2006 the name was shortened to a simpler Le Mans Series. The history of Le Mans Series was changed in 2011 as it was the last season with the LMP1s which would confront each other the following year’s World Endurance Championship. This granted for the new GTC category to allow drivers and teams to participate in endurance racing with a limited budget. In 2012, the Le Mans Series was renamed back to its original name - European Le Mans Series, this was a season of transition. LMP2 stepped up to become the principal class of this series. Success was seen from the 2013 ELMS season with a total of 34 cars taking part and 107 drivers representing 17 countries. The field consisted of 11 LMP2, 4 LMPC, 9 LMGTE and 10 GTC cars. The upward trend continued into 2014 along with a 25% growth and extended 4-hour races which meant more track time for the fans. A total of 45 cars and 150 drivers took part in 5 races across three categories: 11 LMP2s, 16 LMGTEs and 18 GTCs. ELMS has become an essential step for drivers wanting to climb the endurance racing ladder after another action-packed season in 2015. A total of 40 cars including a new LMP3 category and 121 competed on five European race tracks including the introduction of a new LMP3 category. Building on the strong foundations of the previous seasons, the 2016 ELMS season promises to be even better! Races will continue to be 4-hours long however 2-day events will move to 3-day events, with the exception of Silverstone. This allows qualifying to take place on a Saturday and the race on Sunday. This year represents a return to three categories including LMP2, LMP3 and LMGTE. The GTC category will have their own series on the ELMS calendar. An additional race on the 7km circuit at Spa-Francorchamps has been added to the calendar joining the established events at Silverstone, Imola, Red Bull Ring, Le Castellet and Estoril. As in previous seasons, the champions of ELMS will be automatically entered to take on the challenge of the 2017 24 Hours of Le Mans as well as their European titles. In 2016, the ELMS presents three different categories : LMP2, LMP3, LMGTE. The LMP2 category sits just below the top LMP1 class of the FIA World Endurance Championship and is the leading class in the ELMS. This class is reserved exclusively for privateer teams independent of constructors and/or engine suppliers. You can identify this class on track by the blue race number background colour. New open cars are capped at €388,500. Closed cars are capped at €463,500. Each engine is limited to a price of €86,778. Until 2017, teams can choose between three different engines (Nissan, Honda or Judd) and many chassis such as ORECA, Morgan, Zytek/GIbson, HPD, Dome, Ligier, Alpine, BR Engineering. From 2017 on, Gibson technology will be the sole engine supplier for LMP2 cars and chassis will be provided by Dallara, Onroak Automotive, Oreca and RileyTech/Multimatic. First launched in 2015, the new LMP3 category of junior sports-prototype for endurance racing, acts as the first step up the ladder moving up to the LMP2 and LMP1 classes. You can identify this class on track by the purple race number background colour. There are much fewer constraints on this car than LMP2, whether those are budgetary, technical, driving or operation. Overall a completed new car, must not exceed the sale price of €206,000. LMP3s are closed cars and have very similar characteristics to the LMP2s. The chassis and bodywork can be built by five manufacturers designed by the ACO: Ginetta, Ligier, Adess, Dome and Riley. These cars are powered by a Nissan 420 bhp normally aspirated V8 engine paired with a X-Trax gearbox. A GTE car (E for endurance) must be based around a production road car of which 100 examples have been built (25 for a “small manufacturer”, 300 for a carbon chassis). You can identify this class on track by the orange race number background colour. Grand Touring cars must retain the shape of the road-going model from which it is derived and the engine must retain its original position, location and orientation. In circumstances the engine could be re-located if a minimum of 2500 examples have been built. This category is split between “Pro” and “Am”, separating the experienced drivers from the amateurs. GTE Am drivers have to drive a car that at least one year old while the GTE Pro drivers can benefit from the latest developments.